Wingo I Told Southern Ceo Fanning That Kemper Timeline Was A Fraud » Mr. Dunn Goes to Montgomery | Who's Behind the Mask? 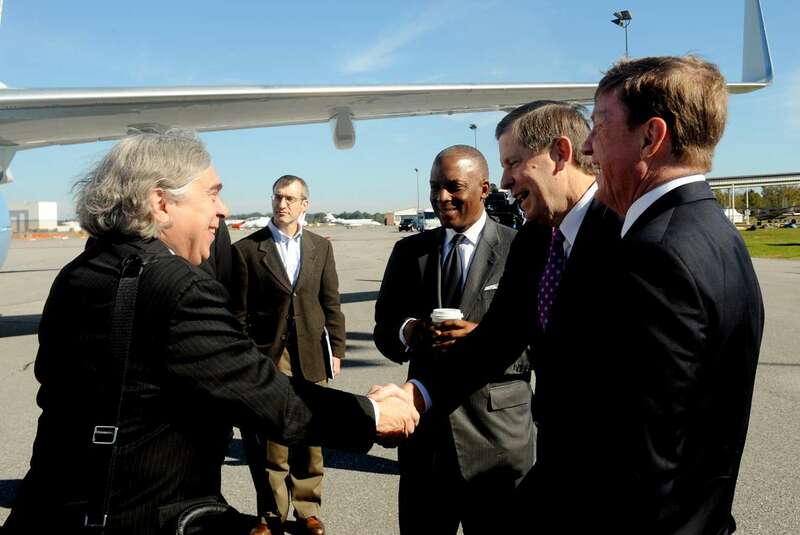 In 2013, before the avalanche of delays and ballooning costs, Southern Co. CEO Tom Fanning, right, and Mississippi Power CEO Ed Holland welcomed U.S. Secretary of Energy Ernest Moniz, to Kemper. Moniz, left, is shaking Holland’s hand. Below, a portion of a September 2014 letter from Wingo’s lawyer to Southern Co. executive vice president Kimberly Green. Though hardly the first such warning by Wingo, this shows he was telling Southern Co.’s top brass that the Kemper Plant completion date then being publicly forecast was “not realistic.” Wingo’s allegations, on this matter and others, have been substantiated by events. Author’s Note: This is a follow-up to a report on this web-site published last February. That story (HERE) provides the legal background of the effort by Southern Company to prevent Brett Wingo from revealing what the company, in its court filings, described as highly confidential information that would cause Southern Co. “substantial and irreparable injury” were it to become public. I did not know nor had ever heard of Wingo before coming across the lawsuit. He later said the story helped him by shining a light on Southern Co.’s effort to silence him. He promised that if he were ever able reveal the information the company feared, he’d provide it to me. Monday night, Wingo called me, and for the first time told me why the company went to court to compel his silence. He also provided some of the supporting documents, links to three of which are at the bottom of the story. They include the Sept. 23, 2014 letter from Wingo’s employment lawyer, John Saxon, seeking to negotiate a parting severance deal with Southern Company and an accompanying letter Wingo provided to Southern Co. executive Kim Greene. In the more than two years since I’ve been working on this project neither Southern Co., nor Alabama Power has responded with meaningful responses to my questions. So, I’m going with the story tonight, with no effort to contact them. 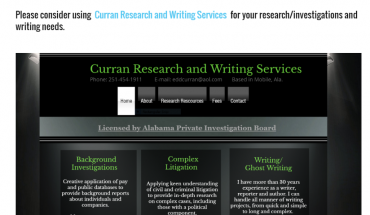 If any media pick up this story, I ask that they credit this website for having it first and look forward to reading, in their stories, responses from Mississippi Power and Southern Co.
Also: In the next week or two I will new posts related to the multi-million dollar “dark money” campaign by Alabama Power — and by extension, Southern Co. — to defeat former Alabama Public Service Commissioner Terry Dunn and provide public relations cover for the Alabama PSC when it raised Alabama Power’s rates by five percent in December 2014. Federal tax incentives of up to $500 million — a figure also known as half a billion dollars — were in danger of evaporating if the deadline wasn’t met. This bit of bad news seemed inevitable, though, at least according to Wingo, not something company officials were ready to reveal to the investment community. In its periodic filings with Securities and Exchange Commission, Mississippi Power and Southern Co., continued to assert to the SEC, and thus, the investing public, that the plant was on track to begin producing power during the final quarter of the year. Here’s one such projection in an 8K filed by Mississippi Power on Jan. 28, 2014. Wingo said he and others at Kemper, including top officials with Mississippi Power, knew there was no way the project would be finished by the end of the year. Wingo asserts that, to keep this news secret, Mississippi Power officials “hijacked” the construction schedule for the all-important coal gasification portion of the plant. He compared it to a schedule for building a house. The foundation must be poured before contractors erect the framing; the frame must be up before the siding is installed, and so on. The massive, and massively expensive, Kemper plant. The dome at the left houses the coal from an adjacent mine. The coal, of a low grade known as lignite, is to be turned into gas, which will fuel the generation of power. Because gas produces far less emissions, it’s touted as a “clean coal” project. The Kemper plant could provide a clean energy future for coal, or, if it fails, further diminish the future of coal as a fuel source in power plants in America and elsewhere. Wingo said some of his superiors went into the computer program used for the project scheduling and “broke the logic ties.” Tasks that logically could not begin until prior tasks were completed were shown, on the altered scheduled, as proceeding concurrently with tasks as yet unfinished. This allowed the company to present a schedule showing a false completion date, Wingo said. Wingo said he reported his concerns to a Mississippi Power executive on Feb. 27. No action was taken. On March 10, Wingo — some might say, brazenly — called Southern Co.’s Atlanta-based CEO Tom Fanning. During a 21-minute call, Wingo said he warned Fanning against signing any financial reports to the SEC showing a projected completion date by the end of 2014. The reason: Because there was no way the project would be completed by then, Fanning and company officials would be placing themselves in jeopardy if it were to be subsequently found that they misled the SEC and the investing public. This is from a call record Wingo provided and showing a 21 minute call on March 10, 2014, to a number with an Atlanta area code. A test call to the number confirmed that it is Fanning’s number. Wingo also provided e-mails from the same time period showing he reported his concerns about the altered scheduling to Southern Co.’s operations compliance director. 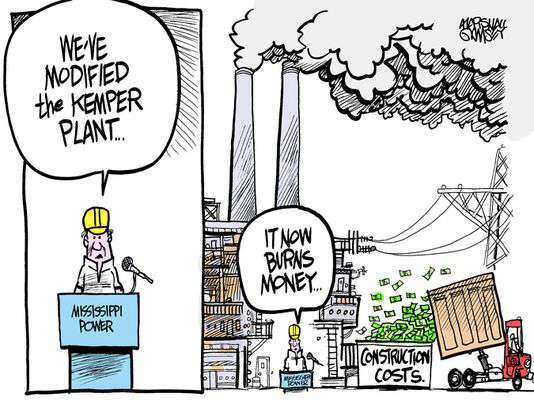 On April 28, 2014, Mississippi Power filed an 8K that, this time, informed the SEC and investors that, no, the Kemper Plant would not be completed by year’s end, but rather, in the first half of 2015. The company did announce, though, that it would begin producing power at Kemper — but with natural gas purchased on the market and not, as the plant is designed, by gasified coal. Wingo asserts that Mississippi Power and Southern Co., would not have corrected the projections when they did had he not agitated for accurate reporting. 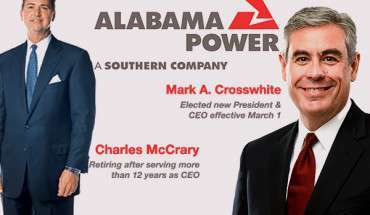 It can fairly be presumed that Mississippi Power and Southern Co., would say otherwise — that the company changed the projections as soon as was reasonably possible based on their normal and exacting monitoring of the progress at the plant. This cartoon from the Jackson Clarion Ledger ran in November 2014. More than a year later — to the chagrin of Southern Co. shareholders — when it comes to burning money, nothing’s changed. According to the September 2014 letter from Saxon (Wingo’s lawyer) to Kim Greene and Southern Co., Wingo’s warnings to his supervisors had repercussions. On Aug. 29, 2014, following a difficult, warning filled summer, Wingo was placed on administrative leave. He was told to collect his personal effects and leave. For Wingo, who then as now lives in the Birmingham area, it was his final day with Southern Co.
Below, a portion of the attorney John Saxon’s letter to Greene, the Southern Co., executive. It bore the subject heading: Brett J. Wingo/Whistle Blowing and Retaliation. Saxon’s letter also included financial terms Wingo was seeking in return for a severance deal, and which Wingo redacted. Settlement negotiations between Wingo and the company collapsed in January 2015. That led to the temporary restraining order filed by the company against him last February. 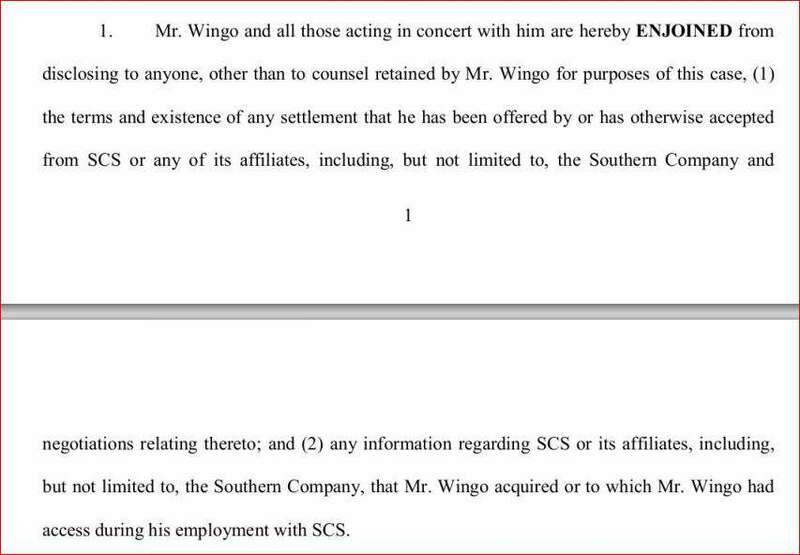 The TRO, and related filings, made one thing very clear: Southern Company went to court to compel Wingo to accept a settlement and prohibit him from talking to anyone about Kemper. The company even sought to prohibit him from revealing the existence of a settlement, were it succeed in winning a court order compelling Wingo’s silence. The following is portion of the company’s TRO filed in Jefferson County Circuit Court. Wingo said he remained on the company’s payroll until Monday, and was prohibited, as long as he was being paid, from discussing the issues that led to his departure. It goes without saying that Southern Co., has or would present an opposing version of events. Whatever that version, it would seem impossible, or certainly difficult, for the company to say Wingo was wrong about his warnings. If anything, the delays were far greater than Wingo projected. On Monday, he said he believes in the technology, but that as a first-of-its kind type project, substantial delays should have been expected from the start and built into schedule. For example, the coal must be heated to 1800 degrees, and, as he said, “no metal on earth” can withstand such heat. A chalk-like refractory material is used to contain the heat, and there have been considerable problems and delays related to those problems, he said. Two weeks ago, Mississippi Power announced — as it has so many times in the past three years — additional delays and increases in the plant’s costs. The company now projects that the gasification plant won’t be operational until August 2016, with the projected price-tag now up to $6.6 billion. “If you ask me, I think they’ll be lucky to finish inside of 2016, and the middle of a 2017 is a more realistic goal,” Wingo said Monday. This is from a resume posted by Wingo last year on an Internet job site. The following are some of the documents and letters provided by Wingo on Monday. If you liked this story, and want to see more like it, please consider making a donation. Directions on how to do so are Here. Also, if you have information and especially documents related to this story or the Kemper plant or related exposing Alabama Power’s role in the campaign against Terry Dunn, please contact me. My contact information, and a description of some of the information I’m seeking, can be found Here.